Las Vegas was the talk of the sports world after the NFL unanimously approved the Oakland Raiders’ move to the desert. But, hold off on the parade just yet because the Raider Nation traveling circus show isn’t coming into town until 2020. There is only one thing for certain; Las Vegas sports fans can begin cheering for their hometown hockey team, the Vegas Golden Knights, next fall. But first, we must get the city excited about what’s to come in the 2017-18 season. Watching this spring’s NHL playoffs will be a great resource to learn more about the lore of the sport that compels millions to watch each night. Knight fans may not have a rooting interest, but it’s an excellent opportunity to understand the pressures, traditions and rivalries that make up the chase for Lord Stanley. April is here, and hockey fans are rejoicing because the playoffs are upon us. Lofty goals are put on the players by the coaching staff, fans and the “dreaded” media as every professional athlete has succumbed to the pressures of high expectations. It’s not fair, but that’s the nature of the business. 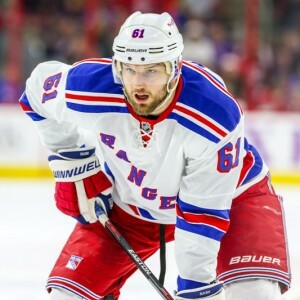 New York Rangers forward Rick Nash is a player who has struggled to equal his regular-season goal scoring proficiency come playoff time. Knight fans will need to take a closer look at him because Nash is a likely candidate to be traded by the Rangers prior to the expansion draft. Knights GM George McPhee wants to have a young roster that gains NHL experience together as a unit, but he’ll need to acquire some veteran leadership to guide them through the rough stretches of the regular season. Nash does have a limited (12 teams) no-trade clause on a contract that has one year remaining. McPhee may need to be creative in extending Nash’s deal in exchange for him to accept a trade to Las Vegas. If the Rangers make Nash available, it might be too tempting for the Knights to pass up the opportunity to trade for a proven goal scorer. The NHL regular season can best be described as a pleasant journey that turns into a turbulent ride called the Stanley Cup playoffs. The most physical challenge any hockey team must face isn’t an on-ice opponent, but rather surviving the toughest gauntlet in all of sports. A Stanley Cup champion needs to win 16 games by basically playing every other night for nine straight weeks. Chasing a championship means everyone on the roster must make that ultimate sacrifice and disregard personal accomplishments to gain the team goal. Common sense is thrown out the window during the process, so unless you have a protruding bone coming out of your skin, every player must be able to play through bumps and bruises to win a Stanley Cup. Hockey playoff legends have been lauded for their ability to put pain aside in order to achieve their ultimate goal. All injuries are considered minor until the playoffs have concluded, and the thought of sitting out a contest to prevent long-term injury never enters the conversation. The NHL has some wonderful playoff traditions that separates them from the other professional sports leagues. Whether it’s growing a bushy beard to extending a handshake to the victor, they’re all a part of the grand tradition. One of hockey’s most popular playoff traditions is players and fans alike refusing to shave until their team has been eliminated from the playoffs. The thickness of the playoff beard is a testament to the length of stay in the hunt for Lord Stanley. Another time-honored playoff tradition is the handshake line at the conclusion of each series. It’s hard to fathom that after spending close to two weeks beating each other up, teams extend a hand in congrats after a winner has been decided. It’s a beautiful lesson in sportsmanship and respect for your opponent, which quite frankly is missing in sports today. 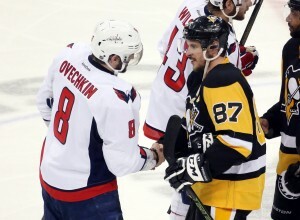 The best playoff rivalry in the NHL today is the Pittsburgh Penguins and the Washington Capitals. Each is in the midst of their window of opportunity to win a Stanley Cup. Both organizations are led by future Hall-of-Famers (Sidney Crosby and Alex Ovechkin) who are known to get chippy with one another when the stakes are high. The Penguins are the reigning Cup champions, but the Caps are patiently waiting for their turn to take them down. Arguably, they’re the best team in the NHL, but the Capitals cannot shake the thoughts of past playoff failures. Last spring, the Pens defeated the Caps in six games by exposing their lack of depth on the third and fourth lines. This past offseason, the Capitals went out and acquired reinforcements, but will it be enough to dethrone the Penguins or will the regular season juggernaut run out of steam once again? Often, playoff hockey is a terrific whodunit, with so many twists and turns that keeps the viewer on the edge of their seat. Suddenly, unsung heroes score the biggest goals in their professional careers and become hockey folklore. This year’s draw will be no exception.